To honor the men and women who serve our country in the armed forces, the LPGA and Bank of Hope Founders Cup are pleased to offer Active Duty, Retirees, Active Reserve, National Guard, DOD civilians and their accompanying spouse complimentary Daily Grounds tickets. Upon arrival, military personnel must go to Will Call, at the Main Entrance, to present their military ID (spouse must present dependent ID) in exchange for Daily Grounds tickets. IDs must be presented in order to receive Daily Grounds tickets. Children 17 and younger will be admitted to the Tournament Site FREE when accompanied by a ticketed adult. Each ticketed adult will be permitted to accompany up to four (4) juniors at no additional charge. 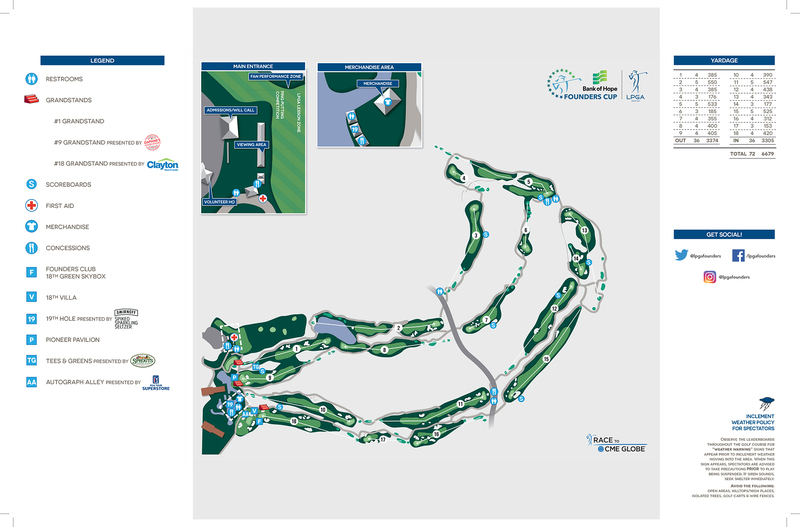 (For sake of clarity, Juniors who fall under this category do not have access to Pioneer Pavilion, 18th Villa, Founders Club or any hospitality area on Tournament Site without a ticket to that hospitality area). - Any orders placed after January 31, 2019 will not have the option to be shipped; you will pick up your tickets/passes at Will Call. THIS TICKET/CREDENTIAL (“Pass”) MUST BE DISPLAYED AT ALL TIMES and is a revocable license to attend the 2019 Bank of Hope Founders Cup (Tournament) at JW Marriott Desert Ridge Resort & Spa (Wildfire Golf Club) as described on the front of Pass. This Pass may be revoked without refund or other consideration if Holder: (a) tampers with or attempts to transfer/re-sell/re-package this Pass; (b) violates any Ladies Professional Golf Association (“LPGA”) and/or LPGA Foundation Tournament Properties, LLC (“LFTP”) rules/regulations, venue security restrictions, or the instructions of authorized personnel; (c) solicits contributions or distributes literature or promotions on or around the Tournament site without prior written permission from LFTP; or (d) uses foul/abusive language or obscene gestures, or otherwise engages in inappropriate, disruptive, or illegal behavior; as determined by the LPGA. All items brought through the gate area into any LFTP controlled venue are subject to reasonable inspection, which may include, without limitation, metal detection and bag checks. Only those items NOT listed on the Prohibited Items list, available at http://www.lpgafounderscup.com/event-info/prohibited-items-list.aspx may be brought to Tournament site. No alcoholic beverages may be brought onto or taken from Tournament grounds. All mobile phone and other electronic equipment must be on silent and only used away from play. No refunds, exchanges, or rainchecks will be issued. Lost or stolen Passes are not the responsibility of LFTP or LPGA, but may be replaced at LFTP’s option. Use of any parking site provided for Tournament attendees is entirely at the risk of the vehicle driver and/or owner. Please take appropriate security precautions and lock your vehicle. Holder VOLUNTARILY ASSUMES ALL RISK AND DANGER incidental to attending the Tournament and related activities, from both known and unknown causes and both obvious and hidden conditions, including, without limitation, being struck by misdirected golf balls or carts, any falls on the Tournament golf course and surrounding areas, and actions of third parties whether such risk or danger occurs prior to, during, or subsequent thereto, and hereby RELEASES, WAIVES, DISCHARGES AND COVENANTS NOT TO SUE LPGA Foundation Tournament Properties, LLC, The LPGA Foundation, Inc., LPGA, Desert Ridge Resort, LLC, JW Marriott Desert Ridge Resort & Spa, Marriott International, Inc. BRE Thunder Desert Ridge Property Owner LLC, Bank of Hope, JTBC GOLF, JTBC PLUS, and each of their affiliated, related or owned companies, Tournament partners, participating players, sponsors, volunteers, media producers and distributors, insurance carriers, agents, licensees, and all officers, directors, employees, agents, sponsors, assigns, and affiliates thereof (collectively, “Releasees”) from all liability to Holder, his/her personal representatives, assigns, heirs, and next of kin for any and all loss or damage, and any claim or demands therefore on account of personal injury, death, or loss or damage to personal, private, or other property and equipment, whether caused by the negligent acts or omissions of the Releasees or otherwise, resulting from or arising out of Holder’s attendance at the Tournament. HOLDER AGREES TO INDEMNIFY AND SAVE AND HOLD HARMLESS THE RELEASEES from and against any losses or liabilities they may incur due to Holder’s use of the Pass, including, without limitation, acts or omissions or allegations thereof while present at or around the Tournament site. The Releasees shall not be responsible to Holder for punitive, incidental, consequential or special damages. Holder agrees that the foregoing release, waiver, and indemnity agreement is intended to be as broad and inclusive as is permitted in the state of Florida, and if any portion thereof is held invalid for any reason, it is agreed that the balance shall continue in full legal force and effect. Any disputes involving the Releasees shall be resolved by arbitration in the State of Florida pursuant to the Commercial Rules of the American Arbitration Association then in force. A judgment upon the award rendered by the arbitrator(s) shall be final and non-appealable and may be entered in any court having jurisdiction thereof. If the Holder is a parent or guardian accompanying a minor or minors to the Tournament, by allowing the minor(s) to attend the Tournament with Holder, Holder is deemed to have given all of the foregoing grants of rights, releases and waivers on behalf of such minors.